We’ll explore the core skills that helped me move into social media marketing. You’ll also learn how I make strategic decisions about the future of the company. 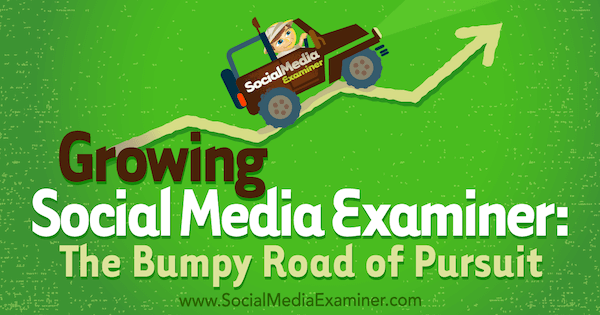 Growing Social Media Examiner: The Bumpy Road of Pursuit featuring insights from Michael Stelzner with interview by Mark Mason on the Social Media Marketing podcast. Before Social Media Examiner, I was known as a writer. I wrote a book called Writing White Papers and helped a lot of out-of-work journalists figure out how to go from writing for magazines and newspapers to writing for businesses. The job of a white paper is to persuade and educate. 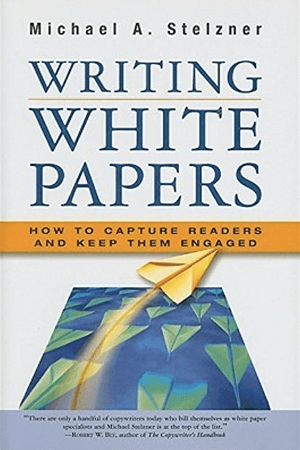 Businesses with expensive or complex products or services use white papers to communicate about them. For instance, a big corporation would hire someone to talk to the engineering and sales departments and translate that foreign language into something a customer could understand. Mike’s first book, Writing White Papers. Mark asks how important the helping aspect is to me as an entrepreneur. Whatever I do, I want to help the largest number of people in a way that doesn’t place a huge strain on me personally. There’s only so much of me to go around, and by creating products that are highly scalable, I can make helping others a big part of what I do. For example, this podcast has more than 10 million downloads and Social Media Examiner has 60 million readers. I wasn’t an overnight success, however. When I started Social Media Examiner in 2009, I felt like I was really late to the social media game. A lot of people say they feel they’re late today. What I lacked in timing I made up for in my ability to ask questions, understand complex things, and communicate how these things work in a way everyone can understand. This skill has helped me throughout my career. In the 1990s, my focus was creative agency work and designing websites, which was novel at the time. I also helped people design annual reports, trade show booth displays, and corporate logos. When I transitioned into a writer and later into social media, my communication skills continued to serve me well. When I started Social Media Examiner, my secret skill wasn’t that I knew anything about social (I knew nothing). It was my ability to discern which people knew things, extract information from them, and convey that knowledge to my audience. No matter what you do, figure out which of your skills allow you to travel into a new space. Then you can be really successful. My entrepreneurial journey has never been easy. By the same token, I think if it had been easy, I would have been bored and moved along to the next thing. I like a challenge and solving puzzles. I’m not one of those people who wants to build a system and then sit back and retire on a beach. I want to keep pushing the envelope and figuring out ways to be better. When I was in college, I dreamed that I was in a room with a couple of hundred people who were congratulating me on my success. I had the dream when I was around 20 years old, and I’m 49 now. That dream didn’t come true for around 25 years. Although I’ve always had certain levels of success, I’ve never had something amazing happen overnight. 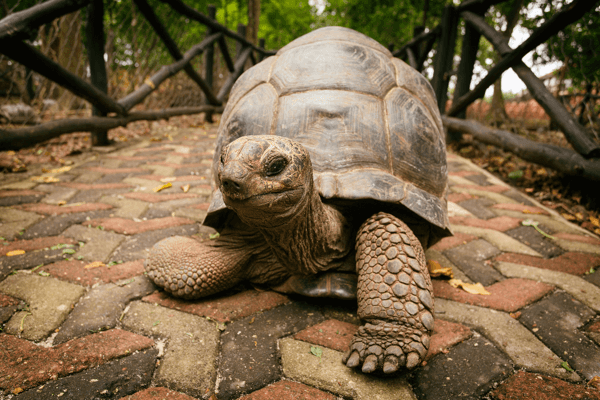 I’ve always been the tortoise, not the hare. Mike has always been the tortoise, not the hare. I realized my dream had come true in 2014, the second year of Social Media Marketing World, when a group of speakers was congratulating me on what I had built. It took a lot of hard work to reach that moment, and although I hadn’t started Social Media Marketing World for the congratulations, it was just nice that the dream had finally come true. Listen to the show to discover how I came up with the topic for this podcast. In 2011, I went to Content Marketing World, put on by Joe Pulizzi. Although it was the first year of his conference, Joe was so calm. When I asked how he’d done it, Joe explained that operations logistics experts could be hired to do everything behind the scenes. Immediately, I began to sense that some of these friends (whom I won’t name) saw my idea as a huge threat. If I started a conference, I could potentially put them out of business. Although they wanted to partner with me, I knew it wasn’t a good idea. I wanted to start an event because I thought others weren’t doing it right. Social Media Marketing World almost didn’t happen. I found myself faced with a challenge: Should I not create an event and keep some of my friends happy, or should I launch an event and potentially lose some friends? For a year, I didn’t do the event just to prove to certain people that I was a friend worth keeping. After a year, I decided to do an event on my own. It turns out those friends are no longer friends, and their event no longer exists (which has nothing to do with me). It was a difficult lesson but I know I did the right thing. Thousands upon thousands of people’s lives have been changed because I decided to move forward with Social Media Marketing World, even though I knew it might burn a bridge with a former ally. 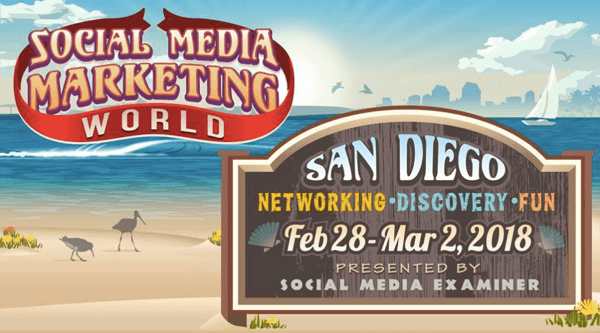 Check out Podcast 227 to hear the story behind Social Media Examiner and the conference. Listen to the show to hear why I believe so many people can relate to this story. In his book, Necessary Endings, Dr. Henry Cloud talks about the concept of a rose bush. A rose bush growing in the wild generates more roses than it can possibly handle. When the bush feeds all of the roses, none of them flourish until someone prunes the bush. Pruning allows the bush to feed the areas that matter. Anybody who knows me knows that I prune things constantly. Just this year, we decided to kill the Social Media Success Summit (an online conference we’ve presented for 9 years), so we can focus completely on Social Media Marketing World. My Kids’ Adventures was one of the biggest projects Mike ended. One of the biggest things I’ve ended was what I call my $300,000 mistake. Basically, I knew that the consumer space, and particularly the kids space, was much bigger than the social media marketing space. So I built a blog called MyKidsAdventures.com, which still exists, and a podcast called Parenting Adventures, with the aim of monetizing it and creating something huge. I learned the hard way the importance of figuring out your business model before you start. I’d made multiple employee hires and invested tons of money into building My Kids’ Adventures. A year into the project, I discovered I wasn’t going to be able to monetize it in the way I’d thought. I’d lost my focus because I was throwing more of my time and resources into my side project, My Kids’ Adventures. It was during this time that I realized Social Media Examiner was becoming more complex and that it was my big thing. I made the decision to shut My Kids’ Adventures down but I didn’t let anybody go; I absorbed everyone into Social Media Examiner. 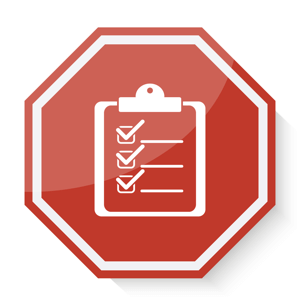 One thing I learned, and continue to practice, is the importance of a stopping list. It’s essential to constantly ask yourself why you’re doing what you’re doing. See what you can cut or bring to a stop so you can refocus your energy on building something bigger and better. This experience was definitely one of the turning points in my personal life and professional career. Listen to the show to learn about my grand aspirations for My Kids’ Adventures. When Social Media Examiner started, it was just me and a volunteer named Cindy King. Eventually, Cindy became a key part of the editorial team, and then a director in the company and director of editorial. A few years back, Cindy was diagnosed with cancer. She never told us how bad it was, so we always thought she would overcome it. I wasn’t prepared when I got the call that Cindy was only going to be with us for a few more days. And then she was gone. Nobody ever wants to deal with that in their personal or business life, and it was a shock to the entire company. I stepped in temporarily to run things. Then I asked one of her employees if they would step up, and under my guidance and training, she become the head of the editorial team. It was then that I realized the processes that live inside people’s heads need to be clearly documented. Plus, everybody should be cross-trained. So I began immediately cross-training everybody, even on the stuff that I do, just in case. The processes that live inside people’s heads need to be clearly documented. The death of a key employee of your company, especially when you’re small, can often spell the end of the company. Cindy’s passing was a shocker and an eye-opener. Documenting processes and cross-training are things big companies do all the time, but small businesses don’t think about it until something happens. Listen to the show to hear Mark’s thoughts about documenting processes. Next, Mark asks about the new Social Media Examiner offices and how I found the space. I told my controller we needed a space that was three or four times bigger than the old office so we could grow. Because office space in this area of Southern California is limited, I knew finding that space could be a challenge. As I walked down the hall of a multi-tenant building, I noticed the largest suite was about to become available. However, my neighbor was also interested in the suite. Because I didn’t feel right about competing for the space with my neighbor, I told him if he wanted it, I’d be willing to try to find another space. I also explained to him why I wanted it and what I was trying to accomplish. To my shock, he called me, said thanks, and told me I could have it. So we’re in this beautiful space with room to grow. Listen to the show to hear more about the conversations I had with my neighbor about the space. 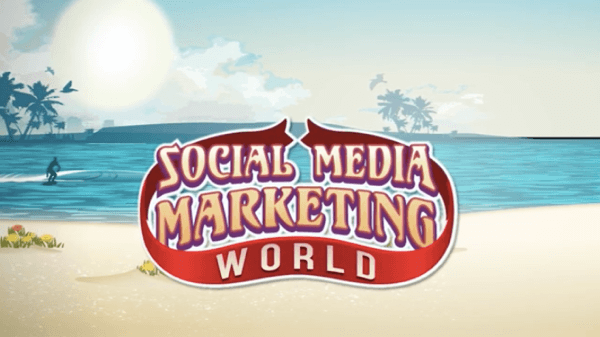 Exciting things are planned for Social Media Marketing World 2018. There’s a lot about next year’s conference that I’m not ready to discuss. What I can say is that we expect to almost double in size in 2018 and almost double in size again in 2019. Because Social Media Examiner surveys 5,700 marketers every year for our Industry Report, we have the data to identify trends. As a result, Social Media Marketing World will offer an exciting mix of content that reflects those trends. The big announcement this year is that the conference is expanding to include creators, as well as social media marketers. Creators are bloggers, podcasters, live video producers, and vloggers/YouTubers. For this audience, we’ve expanded the conference content lineup and are offering a far more economical ticket option. There’s some amazingly cool stuff that’s going to blow people’s minds. Every year, we aim to take the conference to the next level. That’s why at Social Media Examiner, I’m constantly pushing my team to stop stuff that isn’t worthwhile. Listen to the show to hear Mark’s thoughts on Social Media Marketing World. From my work in business, I’ve learned that starting a venture is the hardest thing for people to do because most people are already doing too many things. Only when you decide to create a stopping list can you have a starting list. Only when you decide to create a stopping list can you have a starting list. Think about your life and work and all of the things you habitually do. I often ask my team why they’re doing a certain thing. If the answer is “because we’ve always done it,” then I ask them to question that activity. In addition to the online summit, we stopped managing a LinkedIn group of 35,000 people and something called the Networking Clubs. I’ve shut down my white paper business, too! The Social Media Examiner team only has so many people on it. So instead of hiring new people, I try to help the existing team members optimize their work. And whenever someone on the team suggests a creative idea, I ask what they’re willing to sacrifice because the reality is that when we do too many things, we do nothing well. Mark asks me to discuss how I determine that stopping something is a good idea. I believe every job has three parts: create, maintain, and analyze. Everybody is really good at maintaining, which is doing what they’ve always done. However, most people aren’t that good at analyzing (asking why, how, or whether something is accomplishing what you want). And everyone struggles with creating new things. To balance the tasks of creating, maintaining, and analyzing, I think of a pie chart. You should spend maybe 10% of your time creating new stuff, about 60% maintaining, and maybe 30% analyzing. The analysis and creation buckets are going to ebb and flow depending on where you are in the journey. For example, if analyzing or creating something feels necessary because your business isn’t working, you’ll spend more time on those tasks. Overall, however, the three tasks may balance out and you’ll cycle through them. Because people often struggle with analysis, I explain how I think about it. When you analyze, ask yourself questions like: Is it working? Is it as good as it was last year? If it’s not, why? If this analysis takes eight hours, I say go for it. People rarely take enough time for this. Analyze that data in your spreadsheets to help guide the start and stop decisions you make for your company. A point to remember is that although a lot of people consider filling out a spreadsheet to be analysis, it’s not. That’s maintenance. Analysis is the interpretation of the data on that sheet. For example, Social Media Examiner no longer publishes evergreen content on any social media channel. As a media company, our job is to produce content that everyone loves and shares; however, we share our posts only once. Through analysis, we realized it’s a waste of our staff’s time to push out the same content over and over again because it does nothing for the company’s business objectives. Someday, we might never promote any of our content on social media at all. We may just leave it up to our fans to share the content. These ideas may sound radical and crazy, but it’s not radical nor crazy when you’re constantly analyzing your business and coming up with creative ways to do things differently. Listen to the show to learn what I’d like my legacy to be. Learn more about Mark Mason and listen to the Late Night Internet Marketing Podcast. Check out Content Marketing World and Joe Pulizzi. Listen to Podcast 227 to hear the story behind Social Media Examiner and Social Media Marketing World. Read Necessary Endings by Dr. Henry Cloud. Listen to Podcast 125 to hear more about my decision to shut down MyKidsAdventures.com. Check out the Parenting Adventures podcast. What do you think? 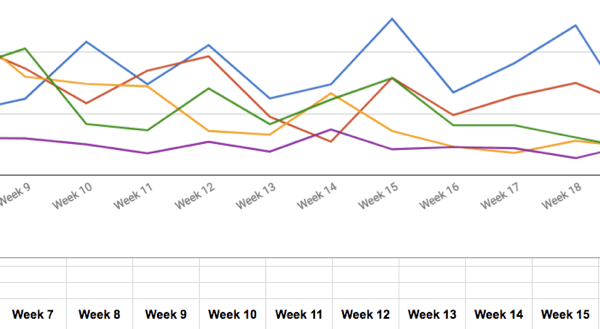 What are your thoughts on the growth of Social Media Examiner? Please leave your comments below.